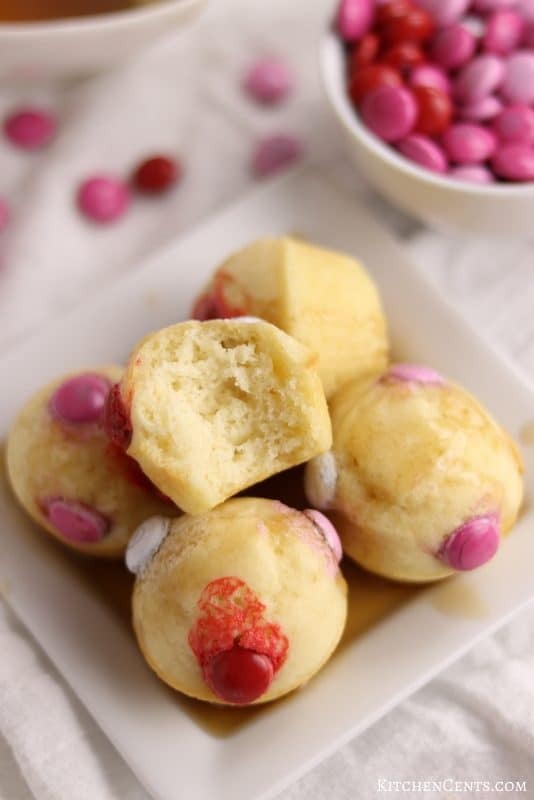 Valentine’s Buttermilk Pancake Bites – mini buttermilk pancake balls topped with red, white and pink Valentine’s M&Ms. Bake up a batch of these pancake bites in under 15 minutes. 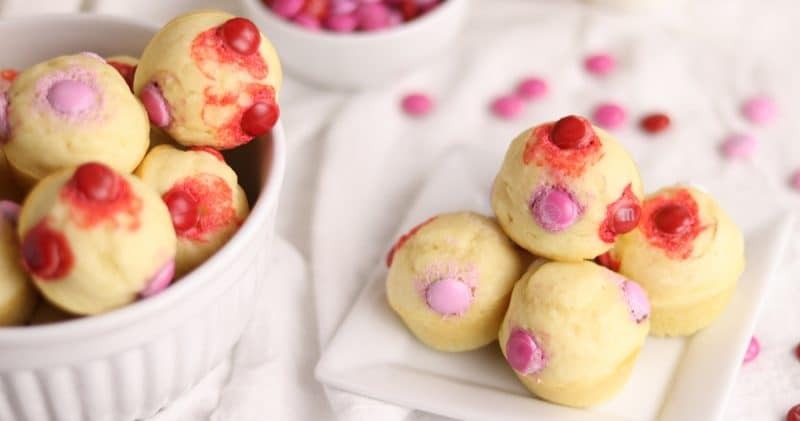 Valentine’s pancake bites are a fun, festive way to celebrate the day of love with your kids and family. These little pancake balls are our version and take on the classic chocolate chip pancake. 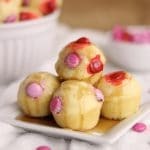 With only 15 minutes, you can make AND bake a batch (24 pancake bites) of these delicious breakfast treats. No syrup required for these chocolate M&Ms sprinkled pancake bite. 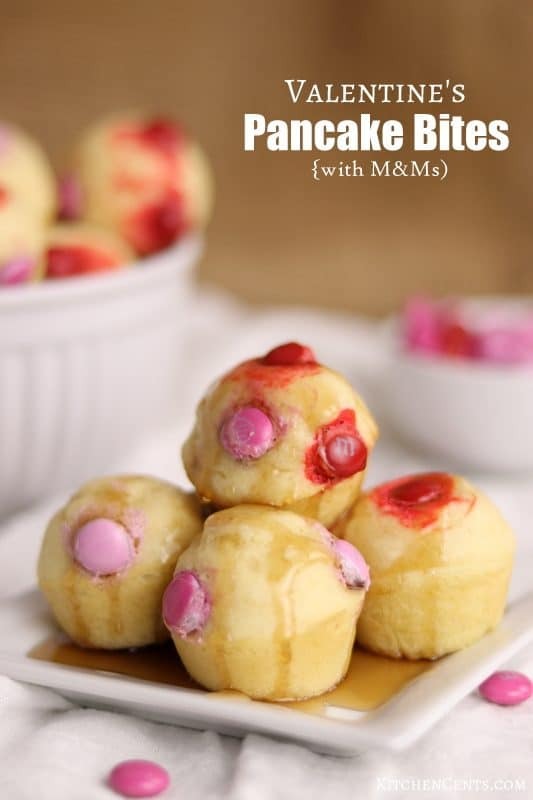 If you like your pancakes extra sweet, these pancake bites are dunkable, bite-sized nuggets of breakfast-y goodness! How do you make these pancakes look like round balls? 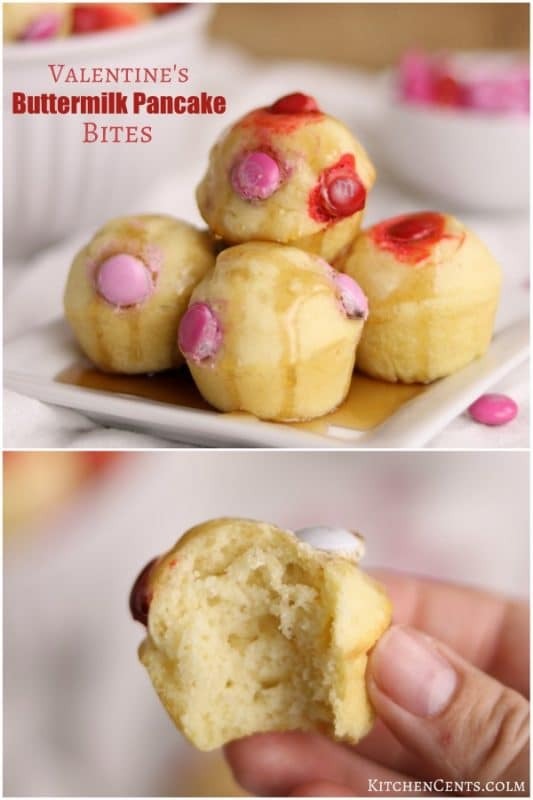 These cute pancake bites are baked in a mini muffin tin. As they bake the batter will rise and the tops become rounded like a muffin. Make sure to spray your mini muffin tin with non-stick spray to let the pancake bites come out easy. 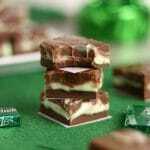 Can I make this recipe in a larger size pan or tin? What kind of M&Ms should I use? Can I use more than 3 M&Ms on each pancake bite? Yes, my kids like to dip or drizzle syrup on their bites so we just put 3-4 chocolate M&Ms on each bite. This adds enough sweetness that if we want to eat them plain, they taste great but also leave a little room for syrup without making them overly sweet. If you won’t be adding syrup you could add a 1/4 of a cup of M&Ms right to the batter along with a few on top. 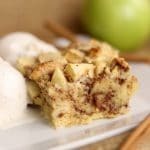 Can I make this recipe with a store-bought pancake mix? Yes, you can. 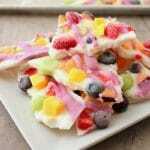 If you already have pancake mix you can use that for this recipe. Make sure the batter isn’t too thin or runny otherwise the M&Ms will sink as they bake. Although you can make this recipe with store-bought pancake mix I’d still highly recommend trying this homemade buttermilk pancake recipe. It’s delicious! 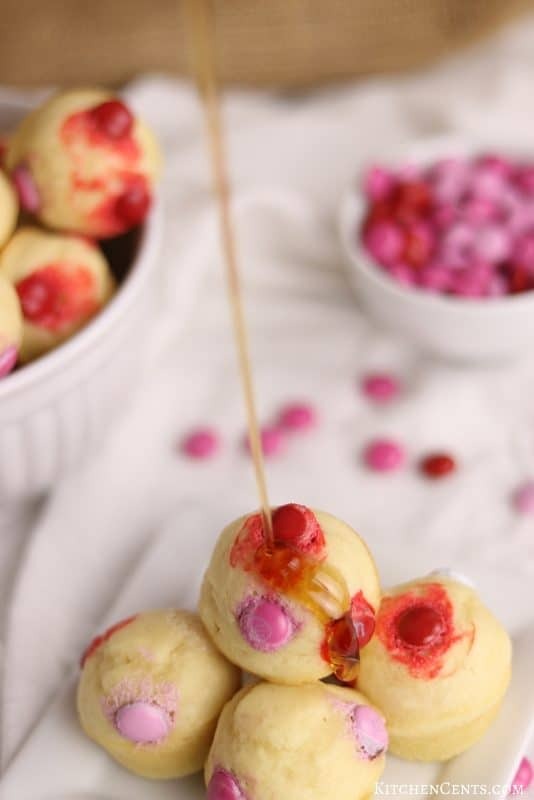 Mini buttermilk pancake balls topped with red, white and pink Valentine's M&Ms. 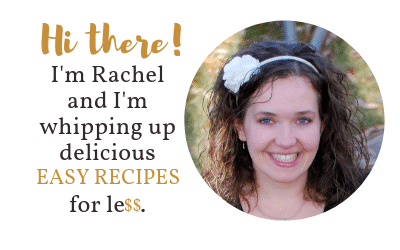 Easy, baked pancake bites in under 15 minutes. In mixing bowl, blend, dry ingredients (flour, sugar, baking powder, baking soda, and salt). Add egg, oil and buttermilk. Mix until incorporated. Will have some small lumps. Don't over mix. 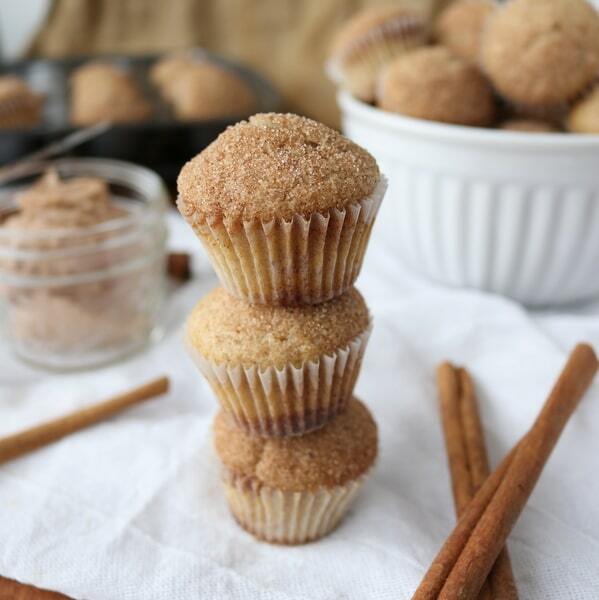 Using a GREASED (spray with non-stick spray) 24 count MINI muffin tin, fill each cup 2/3 full. Add 3-4 M&Ms to the top of each. 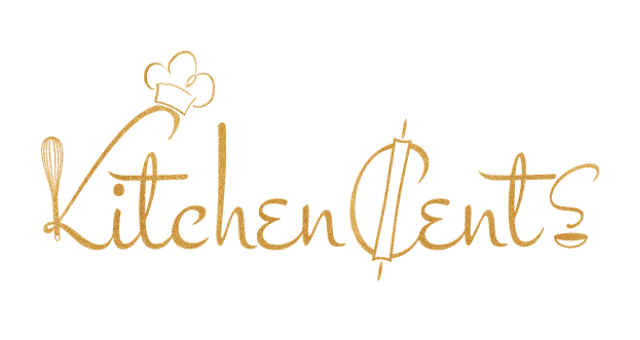 Bake for 10-12 minutes until pancake bites are fully cooked (should spring back when tops are lightly pressed down or when toothpick comes out clean). Serve hot with or without syrup.